Whether it’s kōyō in Japan or leaf peeping in Wisconsin, we all know the pleasure of watching autumn leaves turn red. For taiko enthusiasts, we also know the universal joy of hearing the drums, and knowing that each drum beat brings us together across a global taiko community, a community that grows closer each time we play. 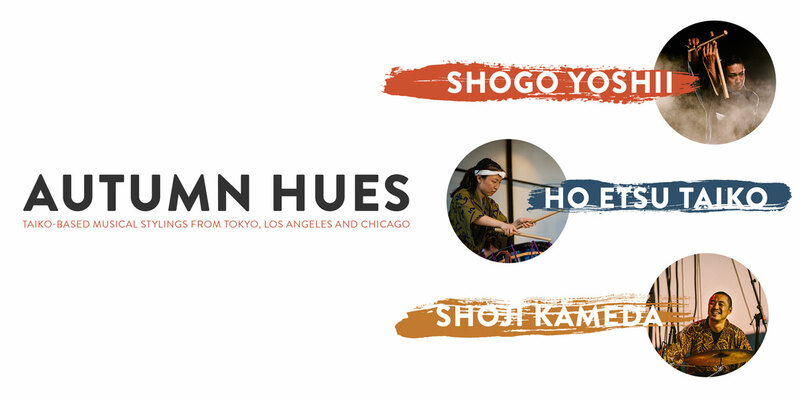 This year, we invite you to Autumn Hues, a joint concert featuring Shogo Yoshii, Shoji Kameda, and Ho Etsu Taiko. Uniting musical inspiration from Tokyo, Los Angeles, and Chicago, Autumn Hues creates connections through creativity and celebrates the turning of another cycle. Born in Yokohama, Japan, Shogo Yoshii began his taiko and shinobue training at the age of 14, and kokyu (Japanese string instrument) at the age of 19. Before joining KODO in 2003, he traveled the Japanese countryside to study folk music and tribal music of Japan. On stage in KODO, Shogo was featured on taiko, metallic percussion, shinobue, kokyu and in dance pieces. In 2010, he joined the musical ensemble of “Babel (words)” choreographed by Sidi Larbi Cherkaoui and Damien Jalet, followed by a music director and performer role in Arte y Solera’s flamenco piece, “Dojoji.” Prior to his departure from KODO, Shogo produced the Earth Celebration 2012. Since debuting as a solo artist in 2013, Shogo has produced musical components and performed at various dance productions in Japan and worldwide. He has also been involved with Barcelona’s “Matsuri Japan” in recent years as a music director, composer and choreographer. He currently tours with a dance production “FractusV” by Sidi Larbi Cherkaoui. Find more information at shogoyoshii.com. Shoji is a Grammy nominated musician, composer and producer. He started playing taiko at the age of 8 and has played continuously since. He was selected through a highly competitive process as an Asian Pacific Performance Exchange fellow, collaborating with master artists from the Philippines, India, Indonesia, Malaysia, Thailand and the USA. He was also selected as an Indonesian Arts Exchange fellow which sent him and three other master arts to central Java for three weeks to teach and perform. Collaborations with international artists have taken Shoji to Malaysia, French Guiana, Mongolia and Bali. He composed an original score for Abduction: The Megumi Yokota Story, Audience Award winner for Best Documentary at the Slamdance Film Festival. He was featured in the music of the hit NBC TV show “Heroes” performed with Stevie Wonder at the 2008 Democratic National Convention and received a Grammy nomination with jazz fusion band Hiroshima for his work on their album Legacy. As a founding member of On Ensemble and the group’s primary creative force he produced On Ensemble’s critically acclaimed albums Dust and Sand, Ume in the Middle and Bizarre Heroes. In 2013 On Ensemble was invited to perform at the National Theater of Japan for their prestigious “Nihon no Taiko” series. Shoji is sought after by groups throughout the taiko world for workshops, masterclasses and compositions. His compositions for taiko are performed around the world and recently Shoji has partnered with Miyamoto Unosuke Shoten to create “kaDON” a new online venture that will provide high quality instruction and repertoire for taiko and fue.